I love Idli Upma. It used to my most favorite evening snack and I even used to carry it in tiffin box for school and even college lunch. A recent post on blogger for Kaima Idli made me remember the Idli Upma which I used to enjoy so much years back. 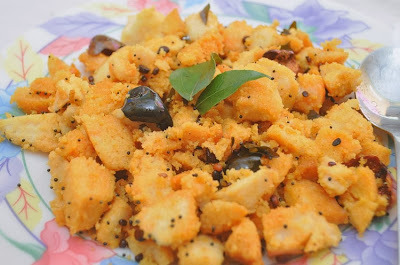 This recipe is the best way to use leftover idlis but trust me I used to love it so much that I used to ask my mother to make it for me with fresh idlis instead of eating them with sambhar or chutney. It is a very quick and easy to prepare snack and gets ready within minutes when idlis are readily available. 1. Use room temperature idlis. Cut them into bite sized pieces. 2. Heat Ghee in a cooking vessel. 3. Add whole dried red chilli either as is or broken into pieces. 4. Add urad daal and chana daal. 5. Add mustard seeds. When the seeds start to splutter and the daal starts to turn brown add curry leaves. 6. Mix well and add the idli pieces. 7. Mix to combine over low flame. 8. Sprinkle salt, turmeric powder if using, red chilli powder if using and any other spice that you wish you add like sambhar powder, tandoori masala, pepper powder etc. I sprinkle all purpose spice mix from Knorr. 10. Serve hot or warm or even cold. 1. Use less tempering items as desired. I like it with a lot of tempering. 2. Add chopped onion if desired before adding the idli pieces and fry till they turn brown. It is very easy and yum too. Lovely clicks. Very delicious & easy to cook snack.............love to grab all. i purposefully make more idlies than usual. So next day i have instant idli upma at home . very nice.. like pictures most.. you have many of good recipes.. do try to visit my place when time permits love to have your feedback dear Recipes Passion ..i have followed u glad if u follow me back.. Have a good day.. Happy Blogging.. I like the not wasting concept and the idea of using idli for this simple yet lovely meal. Idly upma looks delicious love it. Lovely upma with idli . Nice one! I too prepare this in a slightly different manner. Will try your way too next time. Yummy upma looks so flavorful..